Greg and Lori Glasgow. Lori guest-blogged this article and both of them experienced all these NYC rooftops! 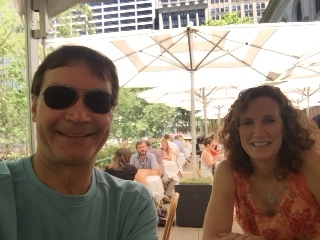 This past spring Greg Glasgow and I set off for a long weekend getaway in NYC. The plan was to visit friends we haven’t seen in a while, see a play, and view the city from as many rooftops as possible. I carried my invaluable copy of Leslie Adatto’s book, “Roof Explorer’s Guide 101: New York City Rooftops,” all over the city. Leslie’s guide book took us to places and vistas we had not seen on previous trips. Exploring rooftops became the theme of our weekend and below is a description of the rooftops (and beer gardens) we checked off. We want to return to NYC and check off some more! Henry’s Rooftop Bar at the Roger Smith Hotel-this happened to be right around the corner from our hotel in Midtown East, relaxing and unpretentious, and the caipirinha (house specialty) was fantastic. 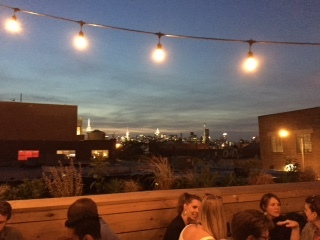 From here, we found our way to Brooklyn/Williamsburg via ferry and took in the view of the East River and the Manhattan skyline from the roof of the Berry Park Beer Garden-such a friendly and festive crowd! The view from Berry Park in Williamsburg / Greenpoint Brooklyn overlooks the Manhattan skyline. 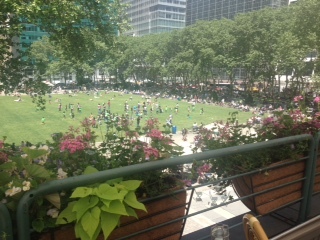 Bryant Park Grill-we took a walk through Bryant Park, followed up with a beer at the Grill and a great view of the park. Top of the Rock-a must see for both the history and the view. Irish Hunger Memorial-we found this little gem on our way to the National September 11 Memorial. After taking in these sites we made our way to La Birreria at Eataly for a delicious lunch. Eataly is a must see for fans of Italian food. Gallow Green at the McKittrick Hotel-quite possibly my favorite so far because we really didn’t know what to expect and we were pleasantly surprised by its atmosphere-“whimsical and rustically elegant”. The best part was catching up over a cold beer with Leslie herself! After Gallow Green, Leslie walked with us toward Chelsea Piers and the Highline. The Highline, an elevated park, is a must see! We ended this day at the Brass Monkey in the Meatpacking District where we made new friends and enjoyed the view of the Hudson River.